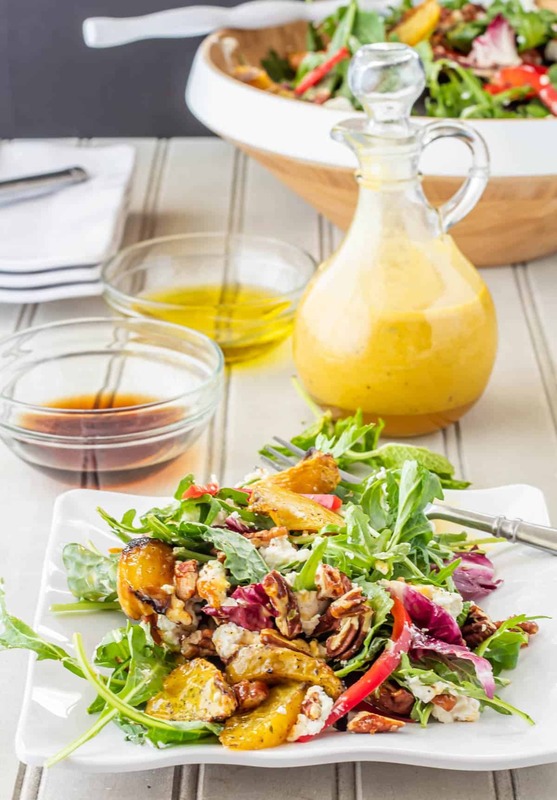 A simple green salad with roasted beets, spiced candied pecans, and chèvre is tossed with a spectacular passion fruit vinaigrette… Passion Fruit Vinaigrette With Greens & Roasted Beets will improve your salad “game,” and it’s oh-so-simple! Should I apologize for bringing you another recipe/post inspired by my month in Peru? Haha. I guess I left a piece of my heart in that beautiful country, and I was certainly impressed by the vast array of food we enjoyed. 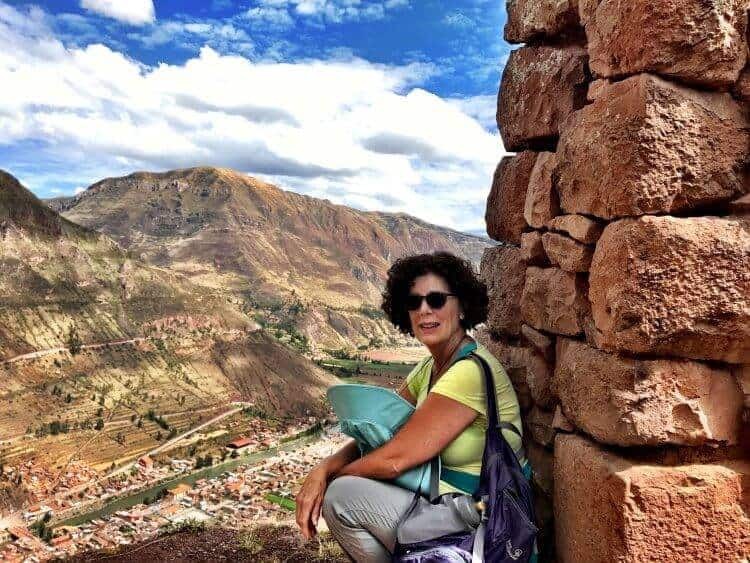 There is so much more to Peruvian cuisine than ceviche and aji de gallina… So while the flavors and memories are still fresh, I want to get my thoughts in WordPress and on my blog for safekeeping. 🙂 Savvy? First, let me give you a little back story on Passionfruit Vinaigrette with Greens & Roasted Beets. I really prefer to refer to passionfruit by its Spanish name maracuya, so forgive me if I go back and forth between the two… My inspiration for the recipe arose in the charming Peruvian village of Pisac in the Sacred Valley. 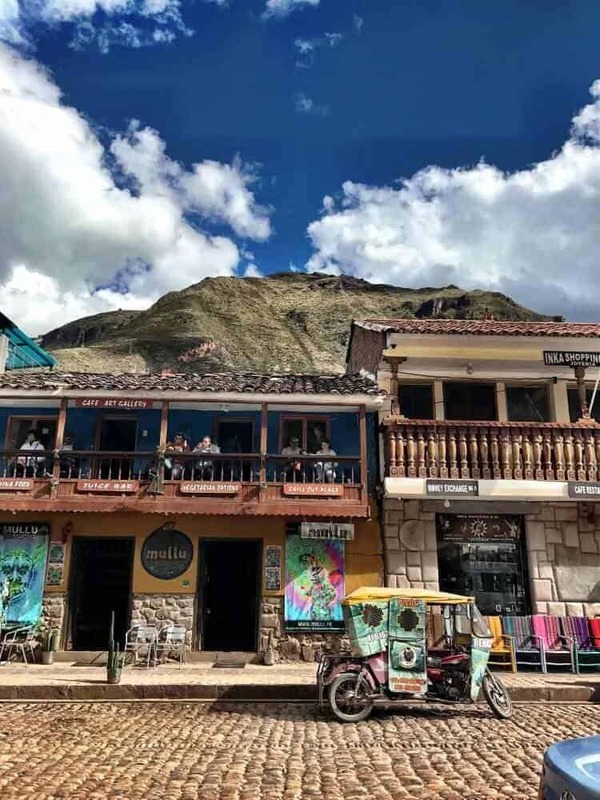 This Bohemian village and its quaint restaurants, shops, and mercado sit at the foot of the Inca Pisac ruins. The Pisac Inca Inn provided us with a beautiful view of the ruins and the surrounding mountains. The town itself is very walkable, but we were thrilled (and exhausted) by our hike up to the ruins. 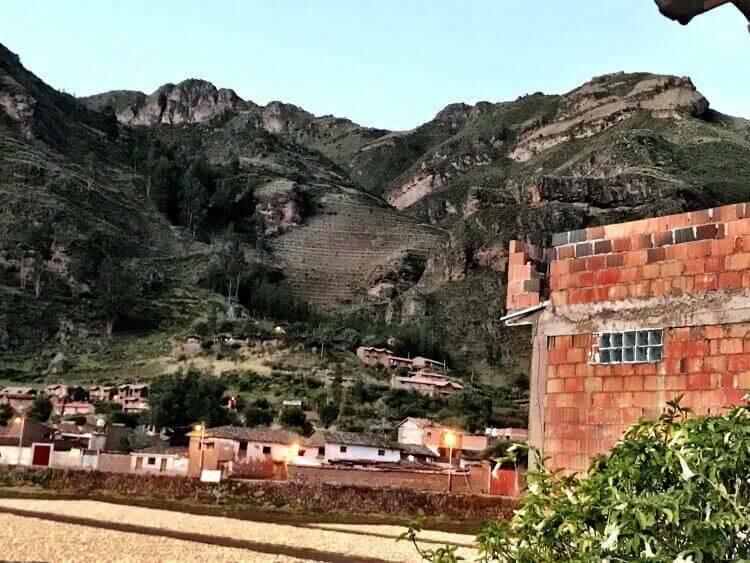 We returned to Pisac ravenously hungry, and our group decided on the popular Ulrike’s Cafe for dinner. The menu offers a range of dishes from traditional Peruvian to tourist favorites like pizza, with an emphasis on fresh and made-from-scratch. As I’ve mentioned ad nauseam, I eat with my eyes, I love colorful and fresh food, and a variety of textures. I stuck pretty close to the combination of greens (mesclun or field greens), veg (roasted beets), cheese (chèvre), and nuts (pecans). I added sweet bell pepper for additional color. However, this recipe is really more about its dressing. You can swap out any (or all) of these ingredients, but you’ve got to try the passionfruit vinaigrette! I’ve been creating my own salad dressings for years, so I have them down pat. I typically start with a 1:1 ratio of acidity to oil, and choose ingredients that complement each other. Maracuya is fairly acidic (pH around 3), so I cut back on the vinegar. I like super smooth, aged sherry vinegar with the maracuya. My standard oil is extra virgin olive oil, but I occasionally will use other oils. I am sticking with it on this one. I typically add a bit of dijon mustard and a small shallot to add depth, and some type of sweetener (fruit preserves, honey, agave nectar, brown sugar, etc.). The passionfruit vinaigrette gets its sweetness (just enough to highlight the fruit) from honey. I am careful to limit sugars in our diet and my recipes, so I do exercise restraint in my salad dressings. 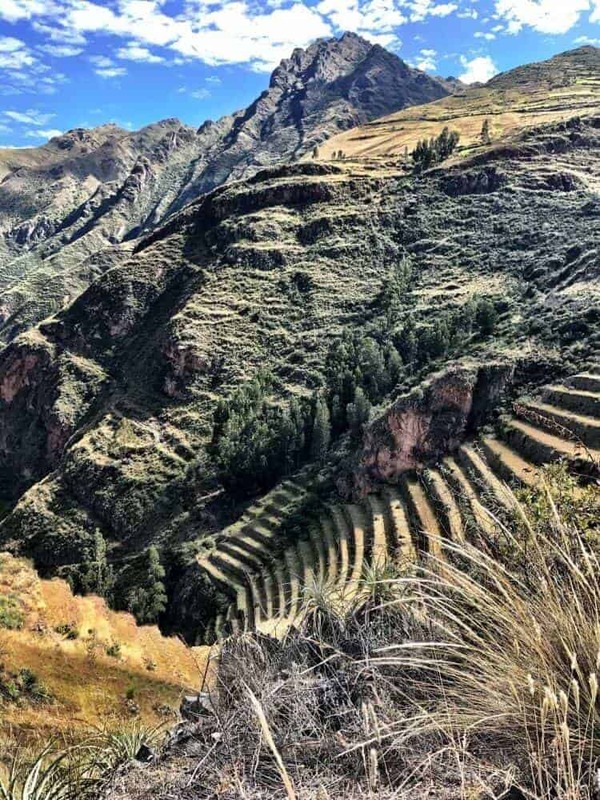 A beautiful close up of the terraces from the trail up to the Inca Pisac Ruins… The hike took us about 1900 feet above the town of Pisac! You’ve got to be in shape for this one! 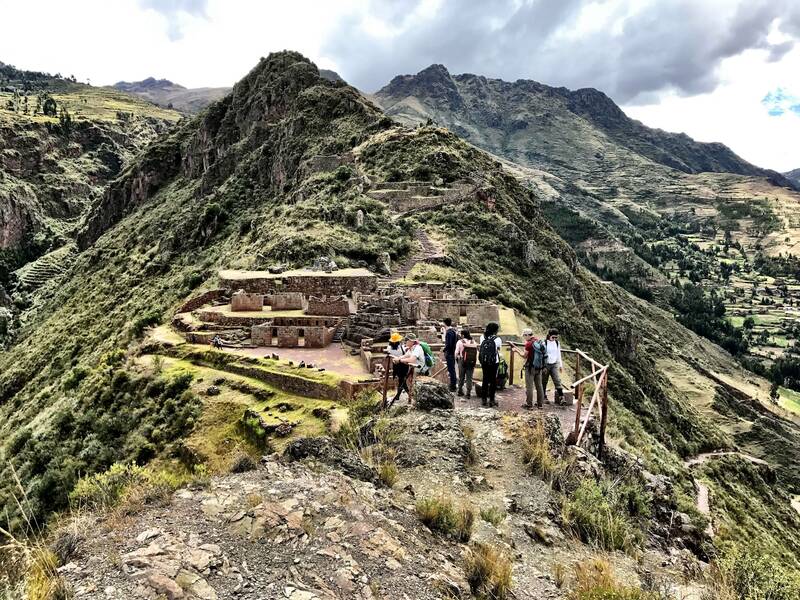 Looking down at Pisac from one of several “watch” towers at the base of the ruins… Exhausting climb, but so worth it! 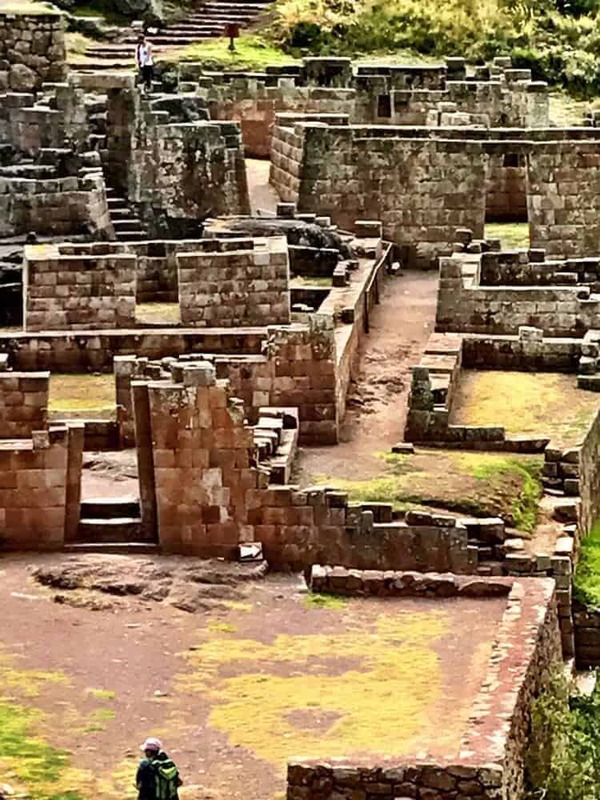 A close up of the ruins shows the amazing masonry skills of the Inca! I left a bit of my heart in Peru. Can you tell? Hasta la proxima vez (until next time)! 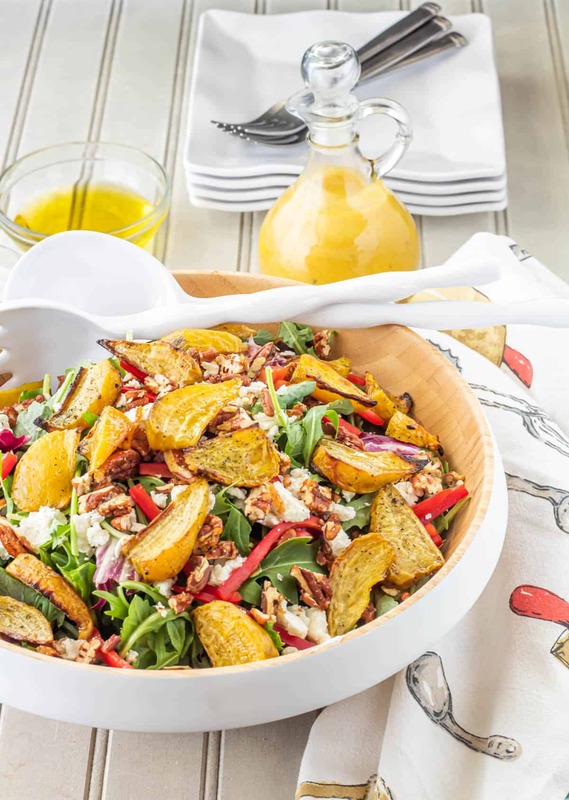 A simple green salad with roasted beets, spiced candied pecans, and chèvre is tossed with a spectacular passionfruit (maracuya) vinaigrette... Passionfruit (Maracuya) Vinaigrette With Greens & Roasted Beets will improve your salad "game," and it's oh-so-simple! Toss beets with a drizzle of olive oil, and sprinkle with salt and a few grinds of pepper. Roast until tender but not soft (20-30 minutes). Meanwhile, candy the pecans. Set a sheet of waxed paper or foil on the counter, and mix up your salt-chile powder blend. In a small skillet over medium heat, melt the tablespoon of sugar. Add the pecan halves, stirring to coat. Continue to stir pecans 2 to 3 minutes being careful to not burn them. Scrape onto the paper or foil, then IMMEDIATELY sprinkle with the salt blend. Allow to cool. Prepare the maracuya vinaigrette by adding all ingredients to a blender or food processor. Taste and adjust. You might want a bit more honey or salt. If it's too acidic for your taste, add a bit more olive oil. Keep an eye on your beets! Assemble the salad. 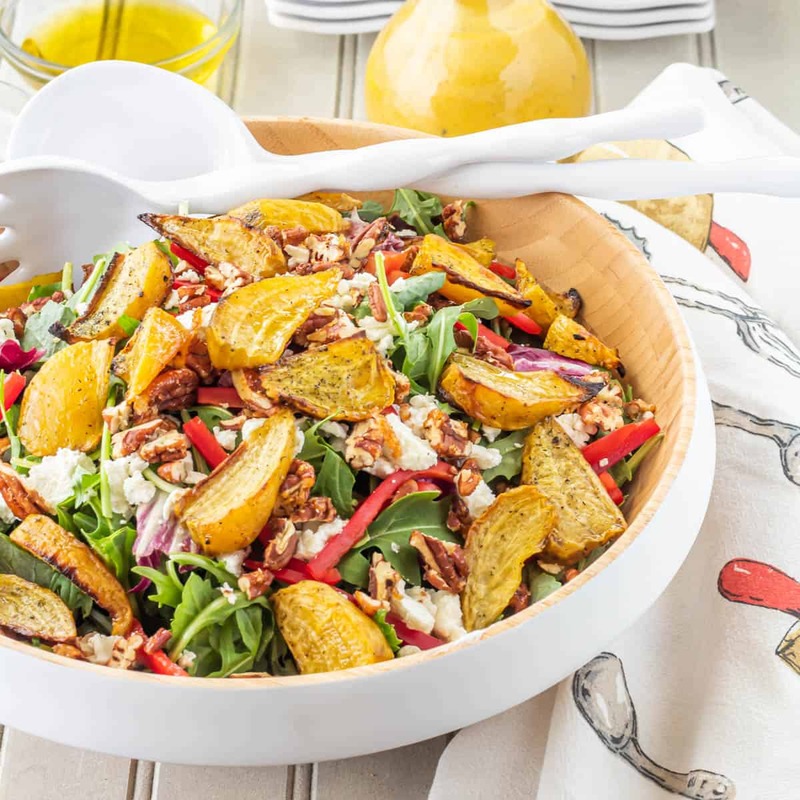 Layer the greens in an ample bowl, top with coarsely chopped pecans, beets, cheese, and pepper strips, then drizzle with the vinaigrette and toss if desired. Enjoy! Smaller pieces of beets obviously roast more quickly. I start with a medium size beet, cut it in half top to bottom, then cut it in thin wedges. You can also do a 1/2-3/4 inch dice. You want the beets tender but not soft. Depending on the size of your pieces, this may take 20-30 minutes. I use a mixture of 1:1 fine sea salt to ancho chile powder. You can use whatever type of ground spice you prefer (i.e. NM red chile powder, cayenne, chipotle, smoked paprika, etc.) Keep in mind you don't want the full teaspoon of salt on your pecans, but it won't all stick. I mix 1/2 tsp. sea salt and 1/2 tsp. chile powder, then sprinkle the pecans lightly while the sugar coating is still tacky. You can substitute feta, cotija, queso fresco for the chèvre. 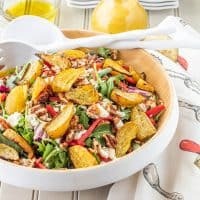 Feel free to use your favorite salad greens, substitute roasted sweet potato for the beets, etc. This salad is substantial enough to serve as a light main dish!. Calories are an approximation based on 4 servings. Yours will vary according to quantity of dressing per serving.